Integrated smartphone technology puts psychological concepts into practice in new and exciting ways. The first-of-its kind Chapter Apps feature invites students to look at how real phone- and computer-based apps illustrate psychology in action. 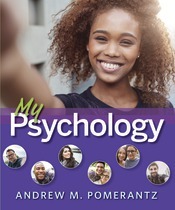 The 37 Chapter Apps in My Psychology can be downloaded for free or viewed on smartphones and computers, and each one is accompanied by critical thinking questions. The Chapter Apps make great in-class activities, or they can be assigned—with additional assessment questions—in LaunchPad.